Happy House Sitters is a house sitting website that robs you! Their prices are sky high costing you way more than other house sitting websites that in fact are a lot better! 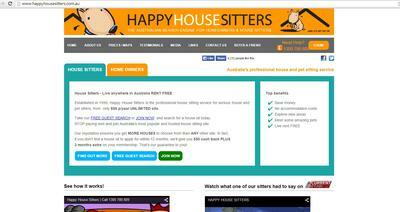 While the good ones charge the sitters about $50-60 per year Australia wide, Happy House sitters charges $80 per zone! And their "zones" are so small even Sydney is divided into several different "zones"!!! Don't let them rob you, there is nothing that can justify such prices, and on top of that we have found that the other websites have a lot more to offer! Use the ones that don't charge more than around $60 Australia wide - no zones. It's not fair that someone is sitting getting in more than 10 times more while ripping people off!!! That is still almost double compared to two cheaper websites that are by no means offering less. Just to clarify, our prices are $89 for 12 months fr the whole state or $99 for the whole country. Join in and write your own page! It's easy to do. How? Simply click here to return to House Sitting Reviews.